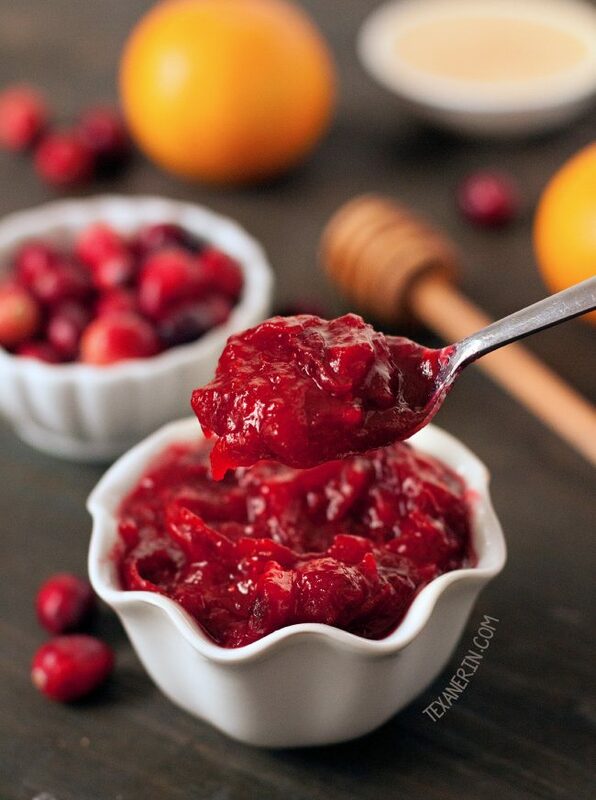 This cranberry orange sauce is totally honey (or maple) sweetened, loaded with orange flavor and is quick and easy to prepare! Perfect for the holidays. 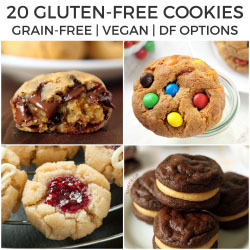 Naturally paleo, grain-free, dairy-free and with a vegan option. Scroll to the bottom of the post for a how-to recipe video. This is probably the easiest recipe I’ll ever post. You mix together cranberries, honey, orange juice and zest and cook it for 10-15 minutes. That’s it. If you need convincing to make this, go check out the reviews in the comments! I first posted this recipe years ago and it’s been a big hit. Mr. Texanerin and I visited my family in Texas a few years ago for Thanksgiving. I was so outrageously excited for my German to experience his first American holiday that I planned everything out months in advance. I emailed people their “jobs” in June (I swear I wasn’t annoying about it! ;)) and I decided that the guy who had never done Thanksgiving before got to make the easiest recipe. Seriously. Have someone who’s totally unable to cook in your family? Let ’em make this! Or this French apple cake, which is also incredibly simple (but delicious!). This gluten-free apple crisp would also be a great option. And by the way, there’s no weird flours in there! Just oats and ground up oats. Before Mr. T made this cranberry sauce with orange juice, my family had never had homemade cranberry sauce. I don’t think we knew how to make cranberry sauce or just how easy it is. It was like that stuff that you had to have, just because it was Thanksgiving, but nobody really wanted. That’s because the canned stuff is just gross. Gloppy and way too sweet. This homemade cranberry sauce is far from gloppy and is just sweet enough! At Thanksgiving dinner, everyone pretty much freaked out at how good it was and they all swore to never buy canned cranberry sauce again. My aunt even went and bought more cranberries the day after Thanksgiving so we could make more. This naturally sweetened cranberry sauce is honey sweetened but you could also use regular granulated sugar if you prefer. That makes the recipe vegan! You can’t taste the honey here – it’s all cranberry and oranges! You can make this orange cranberry sauce several days in advance and then that’s one less thing you have to worry about for Thanksgiving. Awesome, right?! I don’t have kids but if yours want to help contribute something to Thanksgiving dinner, I think this cranberry orange sauce would be a great recipe for kids to make (under supervision, of course!). It’s so ridiculously quick and easy and they can feel super proud of themselves. Mr. T was kind of the star of the day with his homemade cranberry sauce. It’s that good. If you’re looking for something a little different, try this whole berry cranberry sauce from Amanda’s Cookin’! I think that’s about it for me and Thanksgiving side dishes. Next week, I’ll start in on the most important element of any holiday meal – dessert! Until then, I can highly recommend these apple brownies or these pumpkin pecan pie bars. If you want something a little fancier, this caramel pecan cheesecake pie has always been a big hit! 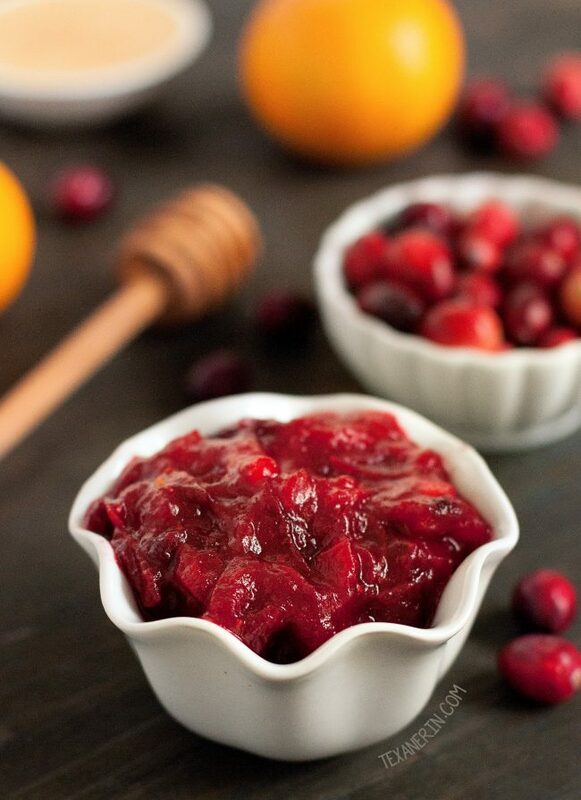 Click below to view the how-to recipe video for this cranberry orange sauce! Over medium heat, dissolve the honey or granulated sugar in the orange juice. add orange zest. Add the cranberries and cook, uncovered, until most of the berries have popped and the sauce has thickened a bit (it'll continue to thicken as it cools, which takes about 15-20 minutes). It takes about 10 – 15 minutes of simmering. I don't bother stirring, but you can if you like. 80 comments on “Cranberry Orange Sauce” — Add one! This is my 3rd or 4th year making this sauce, it’s sooooo good! Why would anyone ever buy it off the shelf? This is 100x better. I’m going to add just a sprinkle of cinnamon this year. I’m wondering if a pinch of nutmeg would be good, also. has anyone tried that yet? I’m so happy you like it! I haven’t tried that and I’m not sure about it to be honest. Maybe just a tiny bit? ;) I’d love to hear how it comes out! Made this in preparation of Thanksgiving! I added ground cinnamon & clove. I used 1/4c raw honey, & 1/4c Real syrup. It smelled amazing cooking! Taste is superb! Can’t wait to share with my family! Thanks so much for this delicious easy recipe!! I hope that they enjoyed the sauce and that you had a great Thanksgiving! Cloves and cinnamon sounds like a great addition. :) Thanks for your comment! Yum! I will have to try it with honey. I never have before. I usually use brown sugar, and add a few cinnamon sticks. Otherwise, it is the same as how you make it. I made this last year and it was great. Would you believe that I had some leftover and had bagels from Thanksgiving breakfast. Idea!!! creamed a package of cream cheese and added the leftover cran sauce. It was even better than it was as a side on Thanksgiving day. This year I’m planning on freezing enough cranberries so that I can make it year round. Oh my word. That sounds amazingly delicious! I’ll have to try that, too. :) Thanks a bunch for your tip! I’m so happy you liked it. Made this tonight as a sauce it was very tasty,spread over my turkey breast very good.Will make all the time. So happy you liked it! Thanks for your comment. I’m pretty sure that I would eat this year round! love the flavors! I love that it’s not super sweet! I found your recipe on pinterest and decided to give it a go as I was nominated to bring the cranberry sauce this year. This was a total success!! Everyone completely loved it! I added in some cinnamon as well for a little more holiday flavor and I doubled the recipe and it still turned out great. Thanks for sharing a wonderful recipe!! That’s awesome! I’m so happy it was a hit. :) I’ve been meaning to try this with some cinnamon. Thanks for the reminder and for your comment! Cinnamon in cranberry sauce is so good!!! This is such a great recipe! It’s my first time making cranberry sauce and I thankfully got the approval to make it paleo ;) It is so yummy and I love the tartness! This is the second year I’ve made this. My husband specifically requested it this year. And it’s even better than I remember…so so so so good. I’ll be stocking up on cranberries to have this any time I want it! Thanks!!!! Erin replies to Jamie H.
Aww, yay! I love that your husband specifically requested it. :) And good idea to stock up on cranberries! I still don’t have any. I hope there’ll be some left for me tomorrow when I go shopping. Thanks for your feedback! I have this cooking right now. Smells great!! How many does this serve? I’ve got a huge group of single airman/young families coming this year and would love to make this. Just need to know how much of everything to get so I have enough. I wish I would have measured out the sauce to have an exact yield! Sorry about that. I looked at similar recipes and they say 6-12 servings (which probably isn’t any help at all!) for the amount of cranberries and liquid I used. I’d say 6 servings to be on the safe side. I hope everyone will enjoy it! I’m making it, right now! I made it, last year, similarly. I will not consume white sugar! Personally, I feel that it’s poison. It’s addicting, causing inflammatory resp6, and diseases! Ha! Unfortunately, the rest of the family I’m bringing this to (we do Sunday dinners, rotating over 3 homes) they will eat the canned crap. You’re bringing this to a dinner and the others are eating canned sauce? That’s such a bummer. :( This is so much better! I’m happy you enjoyed it enough to make again. Thanks for your comment! I normally use store-bought (no added sugar) but I’ve also used freshly squeezed and both work! I can’t tell any difference. :) I hope you’ll enjoy the sauce! Well I made the sauce yesterday for Thanksgiving and it was a hit! Everyone loved it although my husband felt it had a tad bit too much zest in it. I only put 2 tablespoons in so I may try it with 1 next time. It sure looked beautiful in the beveled crystal bowl I had it in! Thanks! I made this tonight with a 8oz bag of cranberries I had on hand. stick. It tastes great. Thanks! I’m so happy it came out well! I also want to try the diced orange thing. :) Thanks so much for the feedback! Yum! Adding the diced up clementine sounds great. :) Thanks so much for your feedback and no problem with your comment in the applesauce recipe (I deleted it so as not to confuse anyone about zest ;)) Happy Thanksgiving! I found this on Pinterest and plan to make it tomorrow! Looks good, and I’ve never been a fan of cranberry sauce. I’m hosting Thanksgiving this year, and I think Mom would be disappointed without some cranberry sauce! Wish me luck! I’ll let you know how it turns out! This was really good. I used less orange zest because I had limited organic oranges. My three year old loved it and I felt good giving him sauce with raw honey instead of refined sugar. Thanks. Mmmm, this recipe sounds wonderful. I buy cranberries this time of year and keep them in the freezer so I can have cranberry something year round. You can beat the cranberry and orange flavor! very tasty! Best part: I prefer honey than sugar…and by luck I had “home-made” honey in stock! Homemade honey?! Mmm! Sounds awesome! Do you keep bees? :) Thanks for the feedback! And sorry for the slow reply. I’ve had a bit of an issue with the comments! Great recipe! When going to make my regular cranberry sauce, I realize I didn’t buy a small sack of sugar. Thank goodness I had honey. Googling for a recipe, I came across your cranberry sauce recipe. I modified a bit using a cup of tart cherry juice for the OJ and adding a small container of Simply Fruit Marmalade for the orange component. And…I always add a quarter cup of red wine to cut the sweet. I can out perfect!!! Thanks for your recipe! I never thought of honey instead of sugar! My new “traditional” recipe! Thanks! Do you think this could be frozen in an ice cube tray for individual servings? Making now =) Used fresh orange juice since I had to zest so many oranges :D Hope it’s a hit! Clementine juice that is ! We have an abundance of satsumas this time of year in Louisiana so I think I will juice some and give this recipe a try. Thanks! Oranges and cranberries always make a perfect pair, love that this is sweetened with honey! I would like to make cranberry sauce and can it as gifts for the holidays. Can I can this recipe? Hi Elise! I don’t have any experience canning so I’m afraid that I can’t say. :( Sorry I don’t have a more definite answer for you! Erin, what a wonderful recipe! As you may know, Cranberry Sauce is not something you typically eat in Germany and I have not really eaten lots of it in the States either – I never quite liked it, to be honest. This, however, I will try for sure!! What?! From the can?! Nooooo. That can’t be! ;) But I’m happy you’ve tried the homemade kind! I love love cranberries!! The addition of orange sounds fabulous! MMMM girl this sauce looks so good! I would serve this at my Thanksgiving table over traditional cranberry sauce!! But have the rest of you tried homemade cranberry sauce?! You’ve gotta try! I found your blog through RachelCooks and I love it, I’m inspired. I live in the Dallas area and just recently started a food blog, after reading others and becoming inspired to go for it. Love your food philosophy. 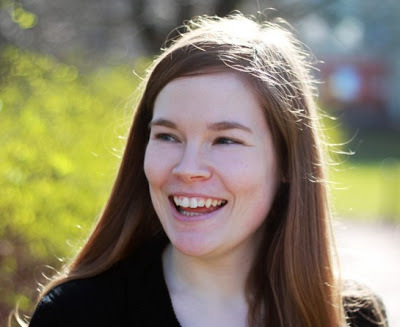 Hi, Celeste! I checked out your blog (it’s great! Pretty tomato sauce.) and your G+ profile. I’m from the same city! :) Thanks so much for stopping by to say hi. So happy you found the site! Beautiful cranberry sauce, I love that you used honey! Your photos of this sauce are beautiful and I love to make my own cranberry sauce I change it up a little each year too. I just may have to try honey this year. Yum! This cranberry sauce looks so good! Great recipe, Erin….and the planner in me seriously loves that you were doling our jobs in June! I was reading along thinking about much I love the simplicity of your recipe, then I got to the part about the spiced cranberry sauce and thought ‘oh wow, we both have spiced cranberry recipes’….except that it was totally a link to my blog :) Thanks so much! !